Heading into the weekend’s Japanese Grand Prix, most assumed – regardless of the race result – the Formula One headlines would be saturated with the news that Sebastian Vettel was leaving Red Bull after six extremely successful years. 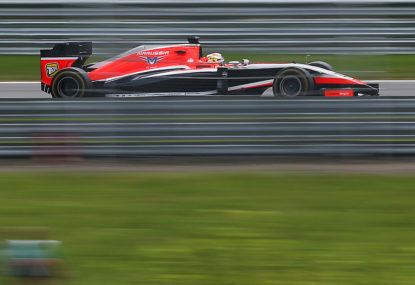 Following a collision with a support vehicle, Marussia driver Jules Bianchi was left with a severe head injury and was rushed via ambulance to nearby Mie University Hostpial in a critical condition. Track conditions during the rain-affected race had worsened moments before the accident, with race stewards disabling the use of DRS and deploying waved yellow flags to inform drivers that Adrian Sutil had lost control of his Sauber at turn 7. Tractors were recovering Sutil’s discarded vehicle, and it was these with which Bianchi collided. They were difficult but not unexpected conditions. Prior to the race the FIA twice asked race organisers Honda if the race could be brought forward to Saturday or earlier Sunday morning. Presumably fearing a financial backlash from unhappy racegoers, Honda held firm and vetoed any requests to change the start time. While it’s clear that the race organisers harboured no malice toward the drivers, their inaction proved short-sighted and uncovers a worrying precedent. When one considers that the Japanese Air Force have confirmed that three of their officers are missing, presumed casualties of typhoon Phanfone, the threat was self-evident and the decision to adjust the start time should never have been placed in the hands of those with the highest financial stakes. Following the incident the race was red flagged (for the second and final time) and with all available medical provisions focusing on Bianchi, the teams were informed it would not be resumed. Those who were interviewed after the event, including Jenson Button, Sebastian Vettel and Felipe Massa, expressed their concern for their fellow racer and lamented that the events of the race paled in comparison to Bianchi’s precarious condition. Despite extending his championship lead, the deeply religious Lewis Hamilton was understandibly distressed by the news he had been given; crossing himself in the cool-down room and managing his consternation on the podium. While the F1 faithful prepares themselves for Bianchi’s prognosis, more unfortunate news has visited the community with the death of former F1 driver Andrea de Cesaris in a motorcycle accident. Here’s hoping for a positive development in Bianchi’s situation so that we can put this awful weekend behind us.